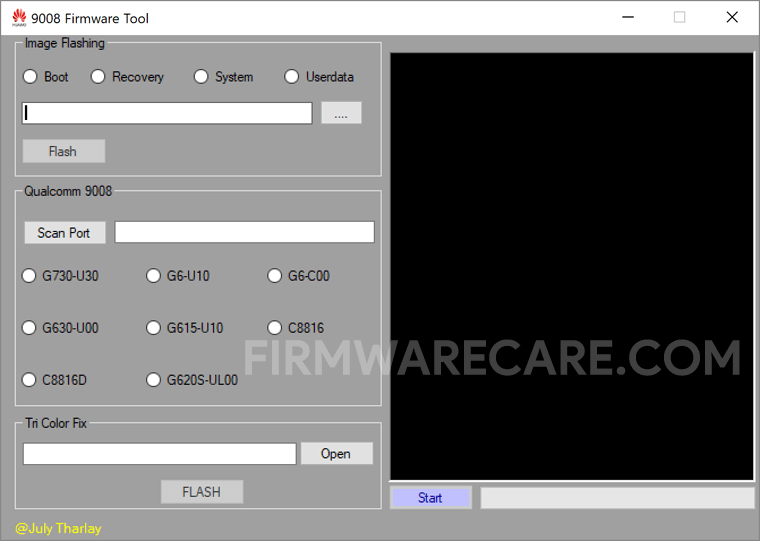 Huawei 9008 Firmware Tool is a small application for windows computer created by Huly Tharlay, which allows you to flash the Stock Firmware, Custom Image, Scan the Port, And Fixing the Tri Color. It allows you to Flash the Boot Image, Recovery Image, System Image and Userdata Image Separately from the Stock Firmware Package. It uses Qualcomm 9008 method to Flash the Firmware, and it supports Huawei G730-U30, Huawei G6-U10, Huawei G6-C00, Huawei G630-U00, Huawei G615-u10, Huawei C8816, Huawei C8816D, Huawei G620S-UL00 devices. In order to use the Huawei 9008 Firmware Tool, you need to install the Universal ADB Driver on your computer. Once driver is installed, load the firmware in the Tool using the browse Button and Select whether you want to Flash the Boot, recovery, System or userdata on your Huawei Device and Finally click on the Flash Button to get it done. [*] Compatibility: The Huawei 9008 Firmware Tool runs perfectly on Windows XP, Windows Vista, Windows 7, Windows 8, Windows 8.1 and Windows 10 (32 bit and 64 bit). [*] Credits: Huawei 9008 Firmware Tool is created and distributed by Huly Tharlay (developer). So, full credits goes to Huly Tharlay (developer) for sharing the tool for free.